With the looming introduction of first HD TV content in the UK (SkyHD and BBCHD) and release dates available for HD media players (HD-DVD and Blu-ray Disc) you might be wondering whether your 2-3 years old Plasma or LCD TV will support it. HDTV will mainly come in two resolutions: 1280 pixels horizontally by 720 pixels vertically progressive (aka 720p) and 1920 by 1080 pixels interlaced (aka 1080i). Your TV should have at least 1280 by 720 pixels to take advantage of all the details in the signal (1024x768, 1024x1024 and 1366x768 will be fine too). 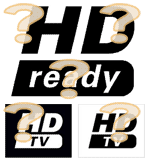 If you choose to connect a HD signal to your traditional TV you will just end up using the SD (standard definition) version and miss out on the details. You may get a better picture due to less compression artifacts. This is the case especially with satellite TV. In addition to resolution, you have to look in the technical specification of your TV for what frequencies are supported. It is quite common for older TVs to accept 1080i at both 50 and 60Hz but to accept 720p only at 60Hz. In the UK, SkyHD has confirmed they will broadcast in 50Hz only which means the 720p signal would not be accessible on older TVs. There are various ways to feed a HDTV signal into a HDTV and your TV should accept one or more of the following inputs: Component (analog), DVI (digital) and/or HDMI (digital). I believe that analog component outputs will be removed from second generation of HD units but at the moment SkyHD boxes and Sony Blu-ray Disc players will feature component out. HDTV introduces content protection of the signal on the wire. This is achieved with the encryption named HDCP (High-bandwidth Digital Content Protection). Ideally your TV should support HDCP on digital inputs (DVI or HDMI) but again first generation of HDTV content will be unencrypted so for a limited time not supporting HDCP is OK. Some TVs support extension boards that can provide recent HDTV requirements like 720p at 50Hz and HDCP. Due to the high price of extension boards, falling HDTV prices and limited life time of Plasmas and DLP Rear Projection TVs you may be better of investing in a new HDTV. Best picture is always achieved if the input signal can be shown without any scaling. This means that a 1080i signal will look best on a screen with 1920x1080 native resolution. The "holy grail" of HDTV are 1080p screens that will be able to display a true progressive 1920 by 1080 pixels signal whenever that becomes a broadcast signal. Some manufacturers know this and market their top-end displays as 1080p but buy with caution as there is a discussion whether these first generation 1080p displays are true 1080p. So what do I have? An almost 4 year old Pioneer Plasma 1024x768 display. No HDMI nor HDCP but I have confirmed it accepts 1080i at 50Hz and has component and DVI in. Due to the age of the screen I am not considering available extension boards. Instead I will get a decent 1080i screen/TV later this year. My SkyHD installation is scheduled for May 22nd so I will let you know shortly thereafter what HDTV looks like on an old beast like that.. This entry was posted at 10:59 AM. Interested to hear how your "non HD" set copes with Sky HD. I have a Panasonic monitor, resolution is fine for HD (even Panasonic do not suggest changing for a newer set! ), with component input. I see the Sky HD box has component out and wonder if I will get a noticeably improved picture? Also, is the REALLY much change in quality by perhaps taking my existing Sky+ SCART output and running it through a converter so I can feed component to the monitor? This would cost about £80 as opposed to a £300 HD box and £120 a year extra subscription. In short my old set copes very well with Sky HD and I am sure you would not be disappointed if you would pick up Sky HD. Some older Panasonic sets had a resolution of 852 x 480 which I would not recommend for a 1080i signal but anything above 1024x768 is great. The picture quality depends on the source being used. Until now BBC's planet earth and the World Cup have been stunning whereas HD movies are a bit hit and miss (Sin City being the best so far in my opinion). The improvement of 1080i over Component compared to SD (standard definition) over Scart+RGB is very, very noticeable. It is very much a wow-factor for anyone who watches Sky HD for the first time. While my set supports a pure digital signal via DVI, it does not support HDCP (encryption) so I have not been able to judge the quality of digital video from the SkyHD box. Sky has promised to keep using the unprotected HD signal over component for a "foreseeable future". In conclusion the SkyHD quality is stunning but I don't think the service is worth the money you mentioned at the moment due to very little true HD content being offered.